Using four changeable capsules Moodo smart fragrance diffuser lets you freely customize your favorite scents. Like the idea? Let’s go on checking. 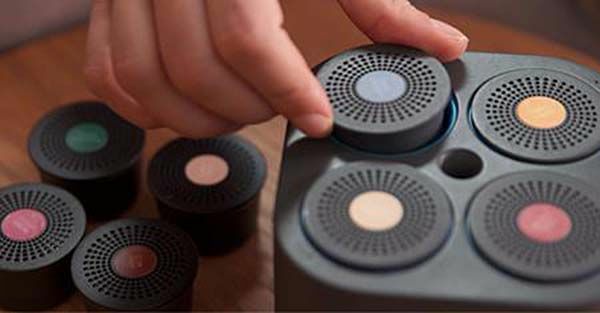 The Moodo is an advanced and flexible app-enabled home fragrance box that measures 4 x 4 x 4.8 inches. As we can see from the images, the fragrance Diffuser shows off a sleek and low-profile design, and its smooth edges and black matte finish delivers elegant and clamato aesthetic style in order to fit anywhere in your house. Moreover, compact design allows you to move it from a room to another with ease. Unlike regular fragrance diffusers, Moodo is able to simultaneously hold four different fragrance capsules. Each capsule contains unique fragrance made of naturally sourced ingredients. More importantly, built-in Bluetooth and WiFi allow the smart fragrance diffuser to wirelessly communicates with your smartphone. Using its custom app, you can freely adjust the fragrance level of every capsule, mixing various scents. Meanwhile, the app also delivers a world of friendly scent-flavors that allows you to choose your favorite scents with ease. Of course, you can also share your recipes with others. Additionally, its innovative shuffle mode enables your Moodo to shuffle your fragrance playlist for keeping things interesting. 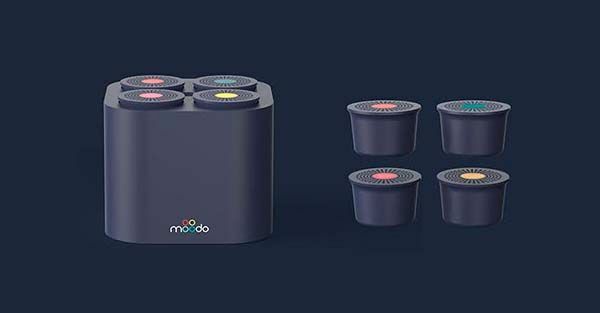 In addition, 4 Moodo capsules can last two months in normal daily use, and its rechargeable battery offers 7 hours of battery life on a single charge. The Moodo has been available for preorder via Indiegogo. Pledging $149 will let you own the smart fragrance diffuser. It will be shipped in July 2017.